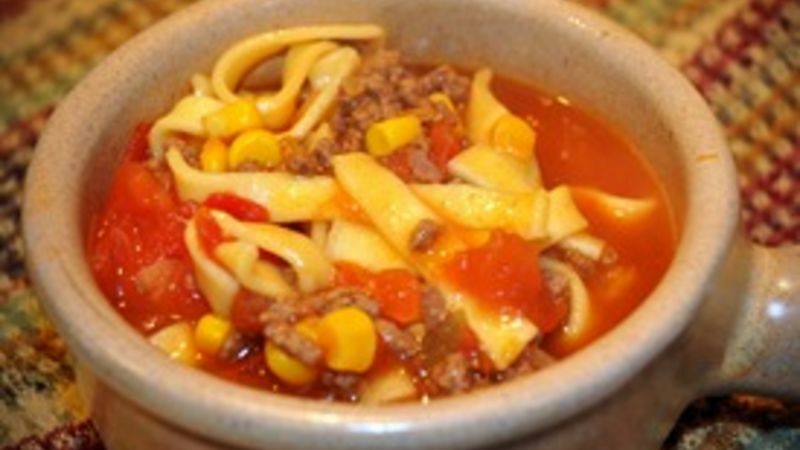 In large stock pan, combine broth, water, browned ground beef, canned tomatoes, canned corn, fresh tomatoes, onion soup mix, dry onions, and seasoned salt. Bring to a boil. Add egg noodles and cook for amount of time on package directions. Serve immediately. Optional: Add 1/4 cup finely chopped fresh basil, more corn, or beans if desired. Goes very well with breadsticks, or ciabatta bread that is brushed with olive oil, sprinkled with garlic salt and toasted under the broiler for a couple minutes. For less of a kick, use mild diced tomatoes and green chilies instead of original flavor.